President Trump held a news conference in Singapore after his historic meeting with North Korean leader Kim Jong Un. Their meeting, approximately 50 minutes long, resulted in the two men signing what Mr. Trump called a "pretty comprehensive" joint document. Mr. Trump signaled for the first time in his news conference that the U.S. could begin to lift sanctions against North Korea before the "complete denuclearization" of the Korean Peninsula is verified -- possibly long before -- and said the U.S. would halt military drills with South Korea to ease the diplomatic process. While the leaders did not speak about what the joint document contains during the signing ceremony, photos of it taken as Mr. Trump held it aloft are legible, and it includes four key points of agreement between the two sides. The most important one, says CBS News correspondent Ben Tracy, appears to be a commitment by the North "to work toward complete denuclearization of the Korean Peninsula." The other three points are equally vague; vows by both nations to, "establish new U.S.-DPRK (North Korea) relations in accordance with the desire of the peoples of the two countries for peace and prosperity," to "join their efforts to build a lasting and stable peace regime on the Korean Peninsula" and to bring home to the U.S. the remains of American troops killed during the hostilities of the Korean War. At his news conference following the summit, Mr. Trump did not give much new detail on the agreement he reached with Kim. He said North Korea was a nation with "tremendous potential and I think he (Kim) understands that and I think he wants to do the right thing." 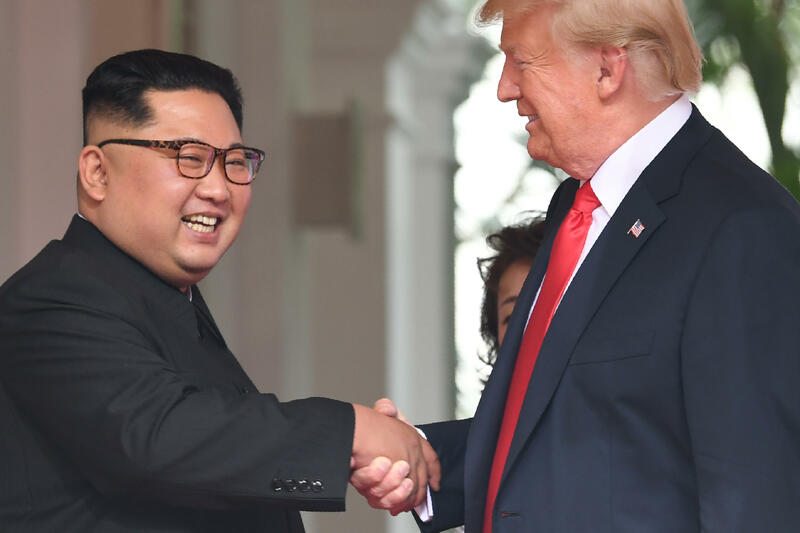 He thanked the summit hosts, and then lauded Kim for an "honest, direct" meeting and for taking the "first bold step toward a bright new future for his people." Mr. Trump said he had spent "very intensive hours together" with Kim, and he again called the joint statement "very comprehensive," and said "it's going to happen." He lauded Kim as a "very smart, very good negotiator," saying the North Korean leader "might want to do this as much or more than me." "Adversaries can indeed become friends," Mr. Trump said. "We signed a very comprehensive document and I think he's going to live up to that," the president said, adding that there would be "vigorous negotiations as soon as possible." "The United States and the DPRK commit to hold follow-up negotiations, led by the U.S secretary of State Mike Pompeo, and a relevant high-level DPRK official, at the earliest possible date, to implement the outcomes of the US-DPRK Summit," according to the the joint statement. Tangible results, and "20 percent"
Mr. Trump said that following the signing of the document, Kim had told him that North Korea would destroy a missile engine testing site as an additional confidence building measure -- a "big thing," according to the U.S. president. Mr. Trump announced a freeze on any new U.S. sanctions against North Korea, and said the U.S. would end its long-standing joint military drills with South Korea. Those exercises have been a persistent thorn in the side of relations with the North, which views them as preparations for a U.S. military invasion. Mr. Trump cast the decision as a cost-saving move. South Korea's Ministry of Defense sent out a text message in response to the U.S. leader's announcement suggesting it had not been aware of his intention to end the war games: "At this point, we need to figure out exactly what President Trump's statement means and what his intentions are," the Ministry said. Even the U.S. military command in South Korea appeared to have been taken by surprise, telling CBS News in a statement that it had "received no updated guidance on execution or cessation of training exercises -- to include this fall's scheduled Ulchi Freedom Guardian." "In coordination with our ROK (South Korean) partners, we will continue with our current military posture until we receive updated guidance from the Department of Defense (DoD) and/or Indo-Pacific Command (INDOPACOM)," U.S. Forces Korea told CBS News in the written statement. Bringing U.S. troops home from North Korea was "not a part of the equation right now," Mr. Trump said when asked for specifics about what he had agreed to. "At some point I hope it will be, but it's not right now." He said, without providing details of how it would happen, that the end-goal of a denuclearized Korean Peninsula would be "verified," by "having a lot of people there" on the ground to ensure it was so. Speaking later to reporters aboard Air Force One for his long trip home, Mr. Trump reiterated that the U.S. would "have to check" Kim's compliance, "and we will check him, we'll check him very strongly." "But he has a plan, total and complete," for denuclearization, Mr. Trump said of Kim. Asked about a timescale for both the dismantling of North Korea's nuclear weapons capability and the prospect of a reciprocal lifting of sanctions and the removal of U.S. forces from the Korean Peninsula -- two objectives for the Kim regime, Mr. Trump again declined to give specific dates, but acknowledged that it "does take a long time to pull off complete denuclearization... scientifically." Mr. Trump appeared to acknowledge for the first time, however, that U.S. sanctions against the Kim regime could be lifted before the "denuclearization" process is complete -- "quickly," even. He said the U.S. wants that process to be carried out "as fast as it can, mechanically and physically," but that "once you start the process, it means it's pretty much over, you can't use them (nuclear weapons)." He said he had learned a lot about the complicated process involved, and was convinced that while it would take "a long time" to complete, North Korea would effectively lose its nuclear weapons capability at an early stage in the process. "There will be a point at which, when you're 20 percent through (the denuclearization process), that you (North Korea) can't go back," Mr. Trump said. "When you hit a certain point you can't go back." He said "we don't know" how long exactly it might take for North Korea to get 20 percent into the denuclearization process, or what specific steps constitute that level of progress, "but it will happen pretty quick." Experts have told CBS News that the denuclearization process could take anywhere from three to 15 years to complete. "Sanctions will come off... when we know, down the road, that it's not going to happen," Mr. Trump said, seemingly referencing North Korea's ability to launch a nuclear attack. "I look forward to lifting" the sanctions, he said. China, North Korea's long-time ally, also appeared keen to see North Korea benefit quickly from the diplomatic process. After Mr. Trump's remarks, Beijing said the U.N. Security Council should consider suspending or lifting international sanctions against the North if the country is determined to be in compliance with U.N. resolutions, and making progress in the ongoing diplomatic negotiations. The U.S. president was asked about the Kim regime's legacy of human rights violations, including the killing of members of Kim's own inner circle. He said he did discuss the topic with Kim, and referred to the current circumstances in North Korea as "a rough situation." "We did discuss it today, very strongly. It's rough. It's rough in a lot of places, by the way," said Mr. Trump, adding, "I think it will change." Mr. Trump went on to say that the current detente between the nations, "probably would not have happened" if it weren't for the case of U.S. student Otto Warmbier, who died shortly after being flown back to the United States after being held in North Korean detention. "Otto did not die in vain," Mr. Trump said. Before the president stepped up to the podium on Tuesday, the gathered media were shown a promotional video, first in Korean and then in English, touting the rapidly unfurling diplomatic process between the Kim regime and South Korea and the U.S. The narration and images portrayed the tension which had manifested over the course of the last year, with missile launches and military maneuvers, but then shifted its focus to the future, saying "the light of hope can burn bright." It was "a story of opportunity," the video narration said, presenting two possible outcomes for the dialogue, "one of moving back, and one of moving forward," and putting the onus on Kim to "shake the hand of peace" and chose to take his country out of "isolation." Mr. Trump said the video was also presented to Kim and his delegation during the summit. Mr. Trump said earlier that North Korea would begin the denuclearization process "pretty quickly," and that he would "absolutely" invite Kim to the White House soon. Kim also expressed optimism during the signing, saying through a translator that he and Mr. Trump had an "historic meeting and decided to leave the past behind." "The world will see a major change," the North Korean leader said. The U.S. came to the summit seeking an agreement for the "complete and verifiable" denuclearization of the Korean Peninsula, while the North was hoping to secure relief from crippling economic sanctions -- what the U.S. refers to as "maximum pressure." Kim also wanted guarantees of his regime's security, and many analysts believe he was hoping for an agreement that would eventually see U.S. troops pulled out of the Korean Peninsula. Mr. Trump was expected to fly back to the U.S. after his press conference.